In short: I buy books All. The. Time. These have been my most recent acquisitions. In my defense, I have finally found another individual with the same taste in literature so I’m excited to dive into some new books I hadn’t heard of before (Warbreaker, The Book Thief, and The Magicians). 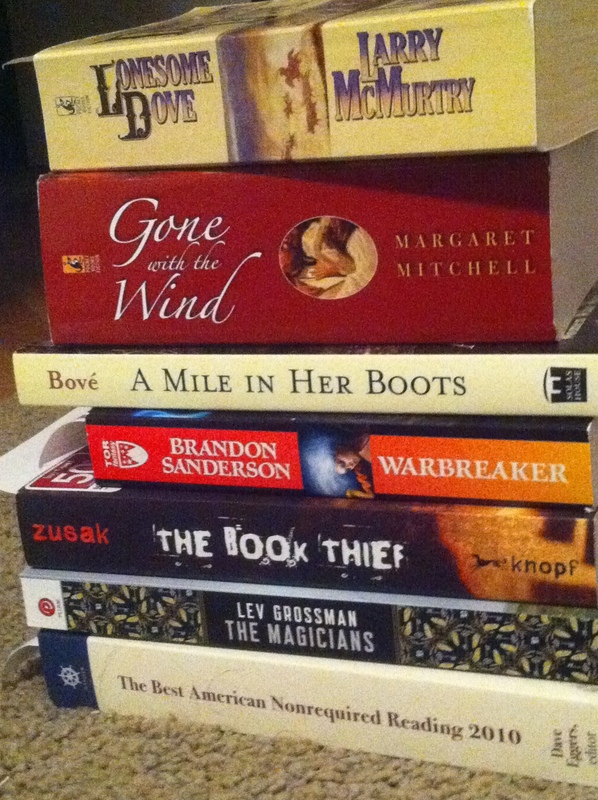 Gone with the Wind is a chunky read for one of my book clubs online. My Mile in Her Boots is missing in action and I FINALLY found another copy of it… and Lonesome Dove is an American classic that I promised myself I simply had to read. And… well… “Best American Nonrequired Reading 2010” is edited by Dave Eggers and David Sedaris. How can it possibly not be good? This weekend I worked on “making time.” I made time to watch the first two disks of “How I Met Your Mother,” a five mile hike an hour from home, a few Borders stops, some spaghetti eating, some Sonic stopping, and to try to take a chunk out of my current read: Edith Hamilton’s Mythology. Whatever the case is, my book buying is not up to speed with my reading. At the rate I’m reading right now, I should only buy one book every… well… year. In the time it would take me to read everything in my to-read pile… I’m going to be a busy person for the… oh…. rest of my natural LIFE. So I ask, dear friends. Is there a support group out there for book-buying-addicts like me? Or am I the only person in the world comforted by the thought that there is a beautiful pile of books by my bed that will always be excited to see me? This entry was posted in life, literature. Bookmark the permalink. Let’s just say I’m BIG TIME guilty. I’ve gone to umm let’s see this weekend I’ve gone to 2 bookstores and I do need to tell myself no more till I’ve read all I own.